This fine Victorian building is part of the busy life of central Ipswich. To be more precise, this is really a collection of buildings, what was known in the 19th Century as 'an ecclesiastical village'. Perhaps the most well-known of these is the red brick former school, at the western end of the site, which appears to be in pretty much constant use. I know it well from dropping my daughter off for brownies. Secluded at the back of the site is that rare thing, an urban non-conformist graveyard. The church is today known as Christ Church, and if you look at the noticeboard you will see that its denomination is Baptist/URC. In fact, this building is now the home of several former Ipswich congregations, who have made their way here as their numbers shrunk, and they sold out and moved in here. Most of the other churches are now lost to us, and so this building survives as a memory of our Ipswich non-conformist forebears. The frontage on to Tacket Street is rather clumsy, the stubby towers appearing to serve no purpose. In fact, if you had come this way before the 1970s you would have seen them surmounted by elegant spires, but these have now gone. It would be good to see them back, although understandably aesthetics are generally not a priority of non-conformist congregations. When the building was opened in January 1858, it was as the home of Tacket Street Congregational Church. But, in fact, it was not the first church on the site. Tacket Street is an ancient street - in medieval times it was home to the town house of the Wingfields, the last remnant of that building being shamefully demolished as recently as the 1990s. Congregationalists had established their first building on this site in the 1680s, at the time of the Act of Toleration, which allowed freedom of worship to all British citizens (as long as they were not Catholics, of course). 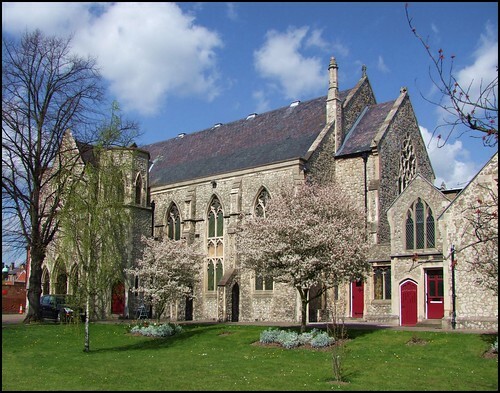 The need for a new church was a symptom of the triumph of Congregationalism over other non-conformist denominations in East Anglian towns in the middle years of the 19th Century. During the course of the next century and a half, Tacket Street Congregational established itself as the main focus of Congregationalism in what was its natural habitat, a busy working class industrial town. The building was extended eastwards towards its near neighbour St Pancras at the start of the 20th Century. But after the Second World War, the attractions of liberal non-conformism began to pale, and so other congregations jumped ship to here - there was the tiny rump of Ipswich Presbyterians, leaving Portman Road church to enter the new United Reformed church via the back door of Tacket Street, and the shrinking congregations of Crown Street Congregational, a fine Grecian building demolished for offices, and, more controversially, Turret Green Baptist church. Because of the arrival of the Baptists, Tacket Street Congregational was renamed Christ Church, but the Baptists who come here must be fairly liberal souls in comparison with the militancy of many of their compatriots in Ipswich's thriving Baptist churches. Along with the interior of St Clement's Congregational church a few hundred metres away, the interior of Christ Church must be one of Ipswich's best kept secrets. It is magnificent. Best of all, the pews of the 1850s have survived (you can see where the organ used to be at the front, before it was moved further east). The grand pulpit of the earlier church survives, carved with fruit and flowers in the Grindling Gibbons style. It has a lockable door at the back to prevent excitable ministers from falling backwards down the steps. I am told that there is a case being made by some members of the church to replace the numbered pews with modern chairs, but this should be greatly resisted. The pews here are one of the best examples of the work of the decade in all England. The gallery is superb - the best of any 19th Century church in Suffolk. In the 1970s, the interior was redecorated in vibrant whites and blues. The lady who showed me around regretted this, but I thought it had been done extremely well - the white paint of the gallery and roofs creates a feeling of light and space that is entirely successful, and unfamiliar. The congregation here should be proud of what they have done to maintain this building into the 21st Century.